The Hotchkis Total Vehicle System (TVS) is an all inclusive kit that has been designed and tested as a system. No need to mix and match components. 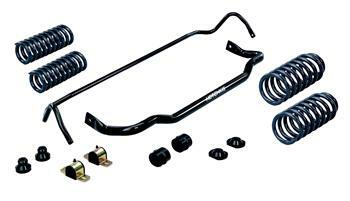 The TVS system includes Sport Coils, Sport Sway Bars, Heavy Duty Tie Rod Sleeves, and an Adjustable Rear Suspension Package (assorment of items depending on kit). By matching suspension components Hotchkis ensures balanced handling performance in a bolt on kit.